The Paulsen Medical and Dental Building (1929), designed by Swedish-born architect G.A. Pehrson, was one of the last major buildings to be constructed in downtown Spokane before the stock market crashed in October 1929. Pehrson designed it in the Art Deco style with Spanish and Moorish styled detailing. "Architecturally, Spokane is distinctive; it is unique. Its people want the best and they have the facilities to get it. [Its buildings are] in harmony with the setting... of Spokane, the beautiful." That description — preceded and followed by pages of praise extolling Spokane as "the best built modern city on the continent" — appeared in an issue of The Western Architect in 1908. That was just shy of two decades after the conflagration that started in an alley between Lincoln and Post consumed 32 downtown blocks, obliterating all but a handful of structures. The devastation created a tabula rasa that allowed the city, then still in its teens, the opportunity to begin anew. Between the Great Fire and the fulsome article in The Western Architect, buildings such as the Review Tower (1890), the Carnegie Library (1904), the San Marco Apartments (1904) and the Hutton Building (1907) went up, and in the years afterward the American Legion Building (1910), the Old Spokane City Hall (1913) and the Crescent (1919) would be built. Their styles are delightfully eclectic, ranging from neoclassical and Renaissance Revival to hybrids of Chicago and Commercial. By 1921, so many noteworthy buildings had sprung up that another journal, The Architect and Engineer, made Spokane its third city on the "Pacific Coast" to be the subject of a lengthy feature — just behind Portland and Los Angeles. The article's author, Frederick Jennings, asked rhetorically why larger cities had so far proven incapable of matching the city's architectural output. Similarly to the 1908 article, he highlighted the "character of design that is very distinctive." Jennings also paid tribute to another building that hadn't existed 13 years earlier: The Davenport Hotel. "It is hardly true," he wrote, "as some people have said about Spokane, that the city is built around a hotel," but he nevertheless cited it as one example of the "rare architectural force and genius for design of Mr. Kirtland Cutter." Cutter's name remains almost synonymous with early Spokane architecture, even to the occasional detriment of his partner, Karl Malmgren. "Cutter's kind of client was a client for whom money was no object," says Jim Price, a community historian and former chair of the Historic Landmarks Commission. "As long as he was in his prime, he was free-spending, and ultimately his carelessness with money and his carelessness with other people's wives brought him down." Once, as he was departing a streetcar at Manito Park, Cutter got a swift kick in the backside from an angry ex-husband. It briefly became the talk of his high-society clientele. 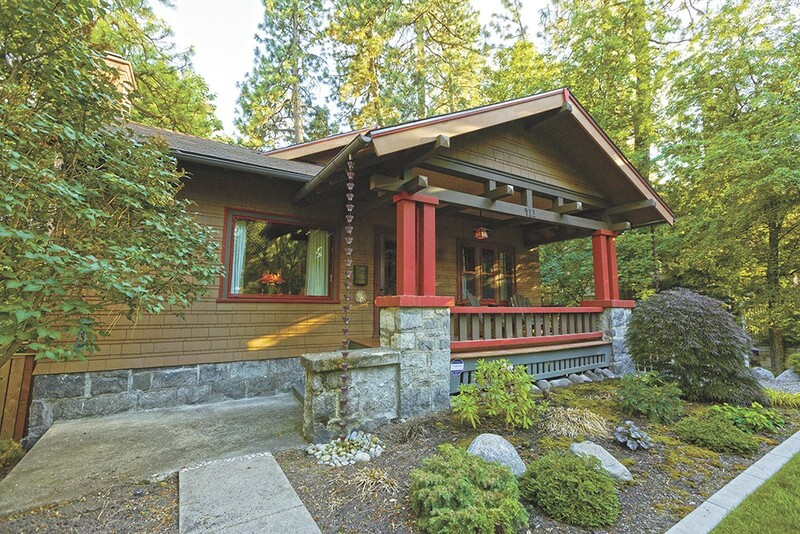 Craftsman homes, epitomized by the work of Greene and Greene out of California, emphasized decorative restraint, structural honesty and solid workmanship, as seen in this Spokane house owned by Kevin and Janet Conway. Of course, the streetcar was more than a public means for cuckolds to exact private revenge. The residential areas that arose along its tracks — "streetcar suburbs" as they became known — introduced the Craftsman homes that are so pervasive throughout areas like the upper and lower South Hill, East Central, West Central and Emerson-Garfield. "In the first decade of the 20th century, they were going great guns. Spokane was extending out in every direction with streetcar suburbs," says Diana Painter, an architectural historian and historic preservationist. "This period of growth coincided with the popularity of the Craftsman style. 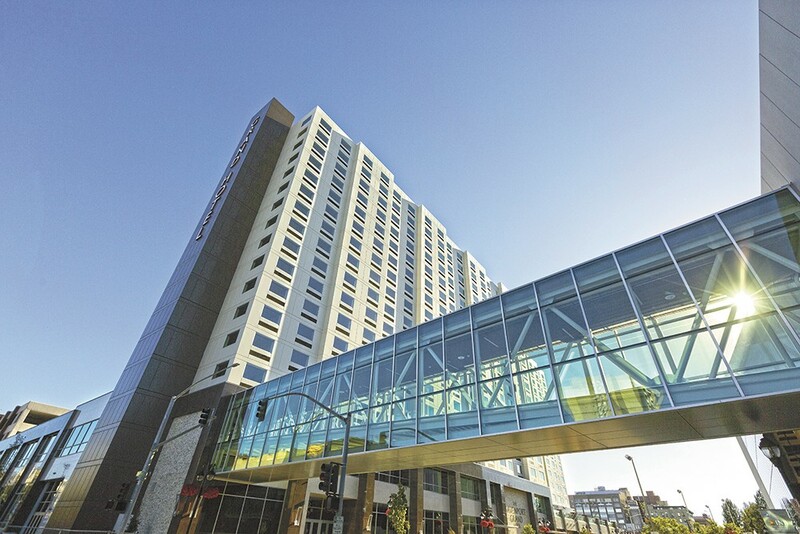 It was modern, it was efficient, and it fit Spokane's aesthetic." The broad template for Craftsman homes, epitomized by the work of Greene and Greene out of California, found favor because of its contrast to the lavishness of the Victorian era. Eschewing the ostentatiousness of turrets and spindlework, the homes emphasize decorative restraint, structural honesty and solid workmanship. Despite their modesty, these Craftsman homes contribute as much to the city's architectural identity as any skyscraper. "In Spokane there was a big drop-off of residential development in 1911," Painter says. "Essentially the market was overbuilt and overextended." The Great Depression would finish the collapse that land speculation precipitated. 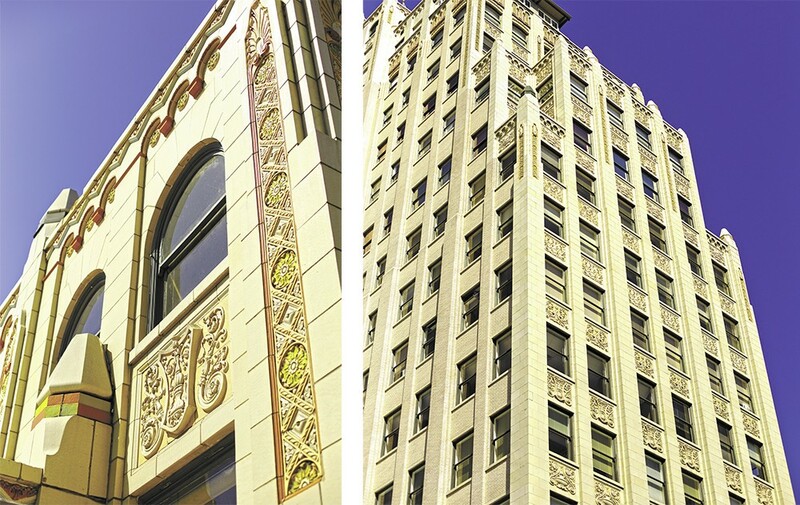 The Chronicle Building (1928), with its gallery of scaly rooftop gargoyles, and the Paulsen Medical and Dental Building (1929), both majestic, white terra-cotta buildings designed in whole or in part by Swedish-born architect G.A. Pehrson, were some of the last major buildings to be constructed in downtown Spokane before the stock market crashed in October 1929. Pehrson's own staff shrank from 29 to two. The angular Spokane Opera House (1974; now the INB Performing Arts Center) was designed by the firm Walker McGough as part of Expo '74's Washington State Pavilion. A postwar construction boom helped to usher in what Aaron Bragg calls "Spokane's golden age of modern architecture — the point at which Spokane went from traditional, old-school design to the idea that anything is possible." Bragg is senior copywriter at helveticka, the local creative firm that curated the exhibition SPOMa: Spokane Modern Architecture, 1948-73 in 2013. The start of that period is marked by the year architect Kenneth Brooks arrived in Spokane. Brooks' most famous local building is the Washington Water Power (now Avista) headquarters, which the magazine Architectural Forum praised as "a bold example for river-front renewal" in 1958. The main building uses an aluminum curtain wall design, whereby the façade offers no structural support. In line with Brooks' broad principles, the campus has social spaces that commingle with the professional. The building primed Spokane for other forward-thinking edifices such as the Unitarian Church (1961) and the Spokane Civic Theatre (1967), both by Moritz Kundig; Gonzaga's Kennedy Pavilion (1961; now the Charlotte Y. Martin Centre) by the firm McClure & Adkison; and the audacious Parkade (1967) by Warren Heylman. For a time, three former students of modernism founder Walter Gropius — Royal McClure, Bruce Walker and Bill Trogdon — were successfully working in Spokane. Like the other civic leaders of his time, Brooks was also actively involved in planning Expo '74, where his ideas about space and community would come to bear on a large scale. 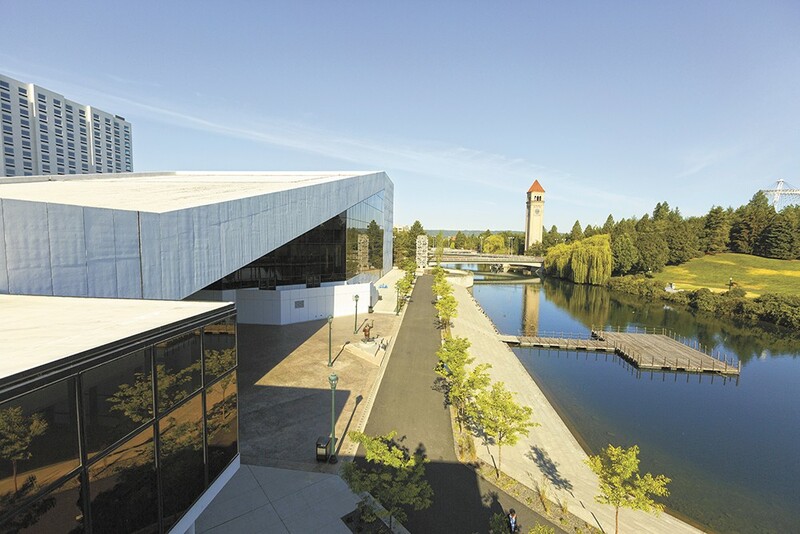 One lasting example of that six-month event is the sleek, angular Spokane Opera House (1974; now the INB Performing Arts Center), designed by the firm Walker McGough as part of the World Fair's Washington State Pavilion. "That pretty much distills the ultimate expression of Spokane modern design," says Bragg. "Clean lines, lots of glass. All this extra filigree is stripped away and the materials are left to stand on their own. What's most important is the acoustics of the space, and yet the exterior of the building has this stark beauty to it." While Expo sparked new construction, it was also a time when Spokane was shaped by destruction. All but the clock tower of the Great Northern Depot was demolished to make way for Riverfront Park, leaving Spokane with what are today some of its greatest and most recognizable physical assets. What took place in the 1980s was less thoughtful. In the early part of that decade, Spokane lost its historic Crescent Block along Riverside. Historic schools such as North Central, Willard, Holmes and Emerson were demolished, and severe, bunker-style elementary schools were erected across the city. Even the fate of the illustrious Davenport was uncertain for the better part of two decades. Then in 2000, developer Walt Worthy stepped in to restore it (sans the splendid Pennington portion, which could not be saved), indirectly sanctioning a quasi-preservationist approach to Spokane's historic buildings that continued with buildings including the Saranac and the Community Building. The Davenport Grand Hotel opened in June across from the INB. What about the new buildings that are currently transforming the layout and skyline of Spokane? Kendall Yards sits on the periphery of West Central's Queen Anne and Craftsman homes and exists in dialogue with buildings like the French Renaissance Spokane County Courthouse (1894; its architect, Willis Ritchie, was just 30 at the time) and Heylman's smoked glass Riverfalls Tower (1973) across the gorge. The Davenport's new Grand Hotel confronts the stark, sloping modernism of the Opera House. "The Grand Hotel might be OK," says Glenn Davis, a local architect who got his start with Walker McGough in 1973, "this cliff façade that it's got, the Opera House is massive enough to go toe-to-toe with that." "There was a time," adds Bragg, "when public-facing projects like these would have drawn some of the finest architects in the area." Bragg and Davis say they see too much "Anywhere, USA" design these days and think it is reflective of Spokane's uncertainty over its identity at the outset of the 21st century. What or who is Spokane? What does the city stand for? What does it hope to be? The answer to those questions, at least in part, rests in whether or not the distinctiveness once accentuated by The Western Architect and The Architect and Engineer is still visible in the buildings that are being erected right outside our windows. Just as a city is shaped by its architecture, it can be said that architecture — or want of it — is shaped by its city. Davis sees a correlation between Spokane's architectural zeniths and how architects and their work were included in the cultural conversation: "Talking was a big difference between then and now. These architects like McClure and Walker, Brooks and Trogdon were constantly involved in civic groups, and they were always pushing the city to realize what its potential was." One architectural area that has received attention, and where Spokane might carve out a niche for itself, is in environmentally conscious construction. There have already been several examples built or renovated locally, and Pura Vida CEO Gavin Tenold believes that gracefully designed passive buildings will become doubly attractive as the costs of climatizing and powering them increase. More than ever before, function will dictate form. Although his career has come to be defined in many ways by the Davenport Hotel, Kirtland Cutter (1860-1939) designed or helped design the Spokane Club, the Sherwood Building, the Monroe Street Bridge (1911) and the Washington Water Power Post Street Substation (1910), which won an industrial structure award in 1920 — not the last WWP building to do so, incidentally. Mining magnates (Amasa Campbell, Patsy Clark, John Finch), railroad tycoons (D.C. and Austin Corbin) and well-heeled professionals (W.J.C. Wakefield, James Glover, J.M. Corbet) used Cutter's talents to compete with one another by building increasingly lavish residences on the lower South Hill and in Browne's Addition. When the available pool of wealthy clients began to dry up in Spokane, Cutter moved to Southern California, where he practiced from 1923 until his death. Kenneth Brooks (1917–1996) came to Spokane in 1948, the same year he'd spent seven months traveling in Europe on a Plym Fellowship under the mentorship of Sven Markelius, a Swedish architect and city planner. That experience no doubt influenced his architectural philosophy. When commissioned to design the Washington Water Power headquarters in 1956, he took a holistic approach. Not only is the building a glinting example of curtain wall architecture (the first of its kind in the region), its landscaping by Lawrence Halprin is of a piece with the structure both functionally and aesthetically. In 1959 it won a national award from the American Institute of Architects. Brooks' legacy lies not in the number of buildings he designed locally, but his populist ideas for urban renewal and civic architecture in Spokane. He outlined these visually in a series of influential displays titled Spokane: A Place in the Sun.